Designers of small, battery-powered electronics can enhance the user experience by extending battery life and further shrinking device size with six new low-power power-management ICs (PMICs) from Maxim Integrated. The MAX17270, MAX77278, MAX77640/MAX77641 and MAX77680/MAX77681 PMICs help to reduce the power-management footprint for space-constrained products such as wearables, hearables, sensors, smart-home automation hubs and IoT devices. They increase the overall system efficiency, while also reducing heat dissipation, an important consideration for wearable products that make skin contact. Designers are striving to make electronic gadgets more integral in consumers' lives by scaling down their form factor, reducing heat, improving efficiency and extending battery life. Meeting each of these criteria is a formidable challenge given the rich feature sets, lower thermal thresholds and smaller capacity batteries required to achieve increasingly compact solution sizes. Maxim is expanding its portfolio of SIMO PMICs to enable designers to overcome these challenges, continuing the compact size and efficiency precedents set by MAX77650/MAX77651. The unique control architecture in the MAX17270, MAX77278, MAX77640/MAX77641 and MAX77680/MAX77681 PMICs allows a single inductor to serve as the critical energy-storage element for multiple, independent DC-rail outputs. This allows engineers to reduce the number of bulky inductors in their designs, thereby improving efficiency, shrinking form factor and reducing heat dissipation. In addition, the low quiescent current of the PMICs plays an important role in extending battery life. With the intrinsic buck-boost operation of the PMICs, the power rails can operate over a battery's entire range. At 50 percent smaller than previous-generation SIMO-only solutions, the MAX17270 SIMO buck-boost converter provides the industry's smallest solution size while reducing the number of inductors and ICs that are required for a power tree. Its quiescent current of 850nA for one SIMO channel and 1.3µA for three SIMO channels is the lowest in the market and helps extend battery life of end devices. In addition, the product's low power consumption prevents overheating and reduces frequent charging cycles for wearables and hearables. They are available in TQFN and WLP package options. This ultra-low-power SIMO PMIC provides three buck-boost regulators with independent voltage outputs (0.8VOUT to 5.25VOUT), 16µA operating quiescent current/300nA standby current and flexible power sequencing. The device is also a charger for small Li+ cells (7.5mA – 300mA CC range). It includes an adjustable 425mA current sink for an LED, eight general-purpose input/output (GPIO) pins and a 3.7125V to 5.3V, 50mA low-noise low-dropout regulator (LDO) with fixed headroom control in a total solution size as low as 24mm2. The PMIC's I2C interface allows an applications processor to monitor the status and control power management. The MAX77278 is ideal for remote controls, health and fitness monitors, body cameras and IoT applications. These ultra-low-power SIMO PMICs feature three buck-boost regulators, a low-noise 150mA LDO, a GPIO output port, a triple current sink for an RGB LED array and flexible power sequencing. Operating current is just 5.6µA and shutdown current is 300nA. 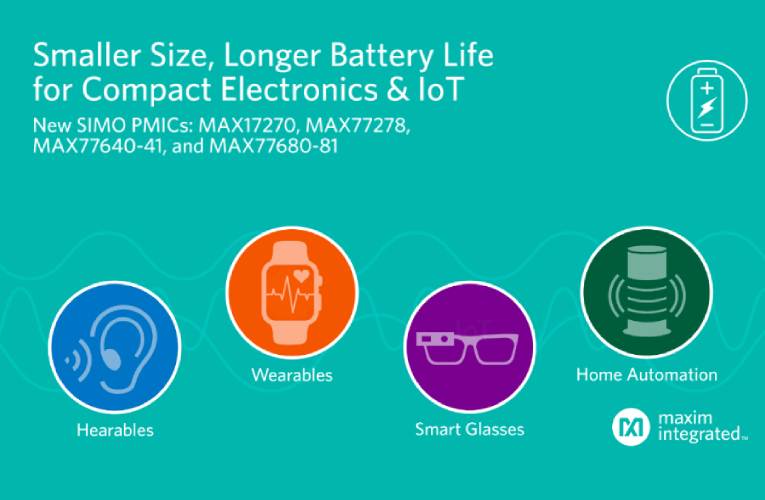 Available in a 16mm2 total solution size, the MAX77640 and MAX77641 are ideal for applications with a built-in charger in areas like wearables, fitness and health monitoring and IoT. These ultra-low-power SIMO PMICs provide three buck-boost regulators, 3.0µA operating quiescent current, 300nA shutdown current and flexible power sequencing. Total solution size is only 15.5mm2. Given their feature set, the MAX77680 and MAX77681 are ideal for more minimalistic platforms that require streamlined resources, such as hearables (Bluetooth® headsets/earbuds) and miniaturized IoT devices (rings, watches, e-pens). The MAX17270 is available for $1.84 (1000-up, FOB USA); the MAX77278 is available for $2.18 (1000-up, FOB USA); the MAX77680 and MAX77681 are available for $1.24 (1000-up, FOB USA); and the MAX77640 and MAX77641 are available for $1.71 (1000-up, FOB USA) at Maxim's website. The ICs are also available from select authorized distributors.